Not being familiar with the Markus Zusak novel from which this film was adapted I had no real knowledge of what I was getting into with The Book Thief. I'd avoided the trailer for the most part after hearing it was a horrible representation of the actual film and that it contained more than cheesy voiceover that made it feel like a trailer put together in the early 90's, but walking out of the film I still wasn't sure what to make of what I'd just witnessed. There is nothing that struck me in a way where I knew I would be thinking about the film for days afterward, but it became extremely clear over the course of the film that lead actress Sophie Nélisse was a true talent to watch and that if there was anything about this little film that might prove to be its mainstay it would be that it introduced the world to a great young actress that could very well go on to become exceptional. That isn't to say there is nothing else about the film that isn't interesting or worth talking about because in all actuality The Book Thief is a very solid picture, a kind of movie we don't get to see all that often these days because lines have been drawn in the sand that have categorized audiences to a point that telling the story of war, and specifically World War II Germany, from the perspective of a child would no doubt be looked at as something that doesn't fit squarely into any pre-determined demographic. Director Brian Percival (Downton Abbey) is lucky to have Zusak's 2006 book as a point of interest though as it has garnered interest in his vision of bringing the story of Liesel to the big screen and though it may not leave a huge cultural impact it is with ease that I say we are more fortunate than not having been given the opportunity to meet her. Nélisse's Liesel is our surrogate into late 1930's Germany up through to the end of the war and while the film doesn't tend to go with any of the typical trappings you might usually see coming from a film concerning Hitler and his minions what it does instead is give us pure insight into the day to day of what it was like to live during that time. In a constant state of fear, in worry of smiling too often or even stimulating ones mind by reading. 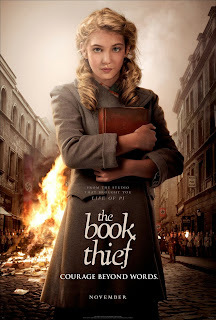 While this all may sound like familiar ground and in some sense it is, The Book Thief is also a film that delivers a wonderful set of performances wrapped in a historical context that will do you no harm in coming to understand it a little better. That, and my wife absolutely loved it so take my words with a grain of salt as she's typically more in tune with what is genuine quality, if I do say so myself. Max (Ben Schnetzer) listens as young Leisel (Sophie Nelisse) reads to him. As narrated by death the film tells the story of a young girl who has lost all hope in the world, who doesn't even know the meaning of the word, but is able to glimpse what it might feel like when taken in by her new parents Hans (Geoffrey Rush) and Rosa (Emily Watson). The film is consistently quiet as it builds the characters that come in and out of Liesel's world due to the fact we see this story unfold through the scared, timid eyes of our young protagonist. 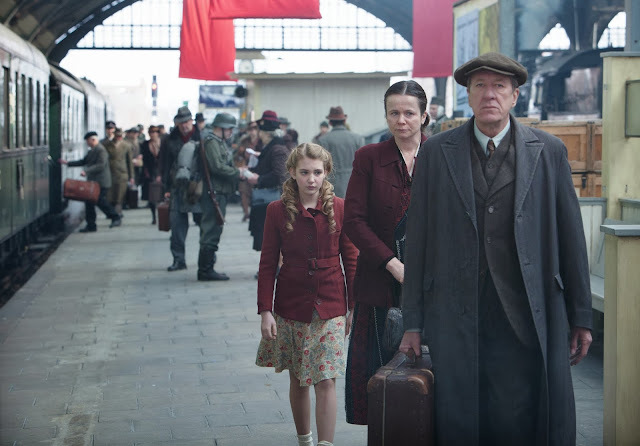 After the death of her younger brother she arrives with Hans and Rosa and as we begin to learn their defining characteristics, the layers of Liesel also begin to peel back. One of the first things we learn is that Liesel cannot read, but one of the first images we see is of her picking up a book that fell out of a gravedigger's jacket while attending her brothers funeral. Liesel wants to read, she wants to better understand the world around her and while Rosa immediately represents the strict and stern mother figure any German leader would have been proud of, or a woman who possessed a certain "thunder" as Liesel likes to put it, Rush's Hans plays the role of the easy-going patriarch with a heart of gold. It is through the gentle persona Hans presents to Liesel early on that cements the bond that grows between them. This relationship is assured to Liesel when Hans offers to help her learn how to read. The two of them, against the book-burning wishes of the Nazi's, go through the limited number of books they have access to countless times as Liesel begins to develop her vocabulary in her own little world of escapism that Hans sets up in the basement. 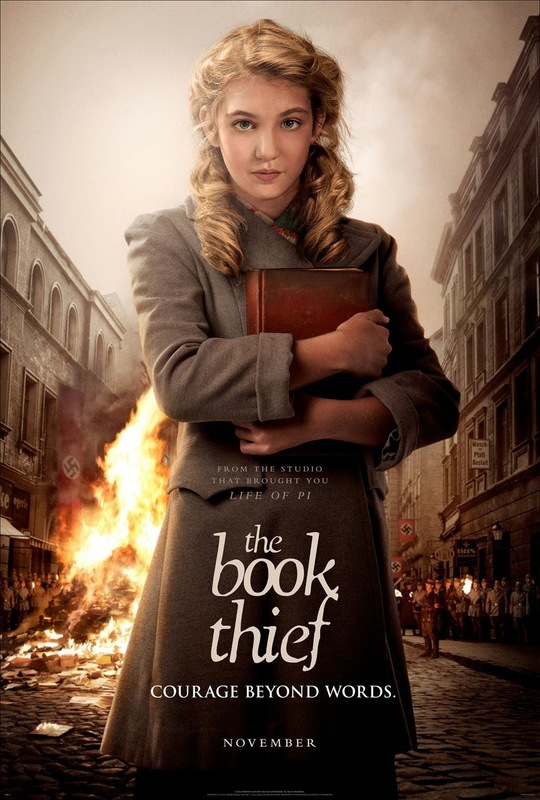 As the film is titled The Book Thief this aspect is critical to how Liesel comes to deal with and understand the events that are going on around her. Liesel becomes friends with a small neighbor boy named Rudy (Nico Liersch) who helps her acclimate with the climate of their little village and gives her someone her own age she can trust. She manages to find a friend in Buergmeister Hermann's wife, Ilsa (Barbara Auer), who keeps a library of her own and allows her to borrow books while also growing fond of Max (Ben Schnetzer) a young Jewish man Hans and Rosa begin hiding in their house. What I liked about the film were the thematic elements it discusses and is able to put front and center that more than overshadow the typical story hang-ups we might get with most WWII dramas. The interesting idea of having death as your narrator certainly presents a specific kind of tone right off the bat and Percival compliments that well with his gray and white color palette as well as the subtle and restrained score from John Williams. I was actually surprised to see this was a Williams score as the credits rolled at the end of the film given it was kept to minimal moments and never became a tool that was used to manipulate the audience. This was more than the right way to go as having something try and over-sell the already fine performances would have done nothing but discredit them. Coming back around to the aforementioned thematic elements it is Liesel's driving force and love for words and stories that help her to understand the preciousness of life and the finality of death that are among the films chief themes. While the voice that embodies death (Roger Allam's to be exact) goes in and out in almost forgettable fashion the idea of it is never far away. Liesel, and death alike, have to come to terms with how some people can go about life, as Hans does, and be more than kind and caring towards others while others such as Hitler can be so evil and unforgiving. This difference is made a point in order to emphasize the bigger scope not only of the human mind, but of the world she existed in. While her parents and her peers feel the need to watch their backs, keep quiet in the streets and hardly even consider a thought against the ideals of the administration Liesel is able to experience an escape through the powerful impact the writings and words of others have on her. When Max arrived, I wondered how much his presence might seep into allowing the WWII elements into a film that was otherwise using the events as a backdrop to convey a very interesting and inspirational point, but instead of succumbing to the typical structure that would have had every action after his arrival be dictated by his presence we are instead asked to watch as he supplies Liesel with more motivation, new ways of thinking and a gift that would prove to be more of an outlet that would define her life. In short, The Book Thief has a strong focus and keen eye for what it wants to say and if it wasn't able to capture every event chronicled in the novel I can hope this at least means it holds a kindred spirit. Liesel accompanies her mother (Emily Watson) and father (Geoffrey Rush) to an unexpected goodbye. The only drawbacks I found with the film were that it often seemed to question itself, as if to wonder if it was heading in the right direction so as to make that point and convey those themes it so distinctly set for itself in the opening scenes. As each scene went by I wondered what ultimate moment we might be building towards and again, as death lurked ever near I never expected it to be happy, but while the driving force behind Liesel is clear and how each of the characters surrounding her contribute to her character and her ever-evolving understanding of the world the same could not be said for the story. In most cases, this is fine, it would be considered more of a character study than anything else and that is definitely an appropriate term to slap on this film, but the scope and setting give us an overall sense that what happens throughout the film might have larger consequences than those that come to pass. Granted, it is vital to the story to understand the climate of what is occurring outside the walls of the small town the majority of the action takes place in and it is more vital for the audience to understand how that transforms the characters this story is set around and how they either abide, escape or fight back. While this isn't necessarily easy ground to stand upon what makes up for many of the meandering moments throughout are the performances. As said earlier, Nélisse is a bit of a revelation and her large, telling eyes give us a peak into her soul that only a gifted actress might manage. Rush is at his best here being his charming, self-deprecating self while I would go as far as to say that Watson deserves awards consideration for her strong, yet subtly-transformative performance as Rosa. While the pacing may be a little deliberate and leave you wondering what the point of all this might end up being, what never fails is the development of these characters as we come to know each of them for who they truly are, as if they were family and not just on the basis of their definitive characteristics, but deeper than that in the sense that we understand not just who they are with other people, but who they can be and how honest they are with themselves. It is the human element that always ends up enticing in these large-scale dramas and while the human element is what will always be unanimously uplifting and heartbreaking about Nazi Germany what makes The Book Thief awe inspiring is the way in which we come to see that piece of history for more than what our general knowledge says about it, but instead a personal tale about the small people who dealt with it every day.